Dynaudio began building speakers in Denmark in 1977, at first building their own crossovers and buying drivers from other companies. 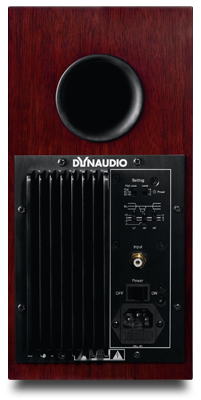 By 1980, though, they’d come to the conclusion that they could build better speakers by designing and manufacturing their own drivers; ever since, Dynaudio has built its legacy primarily on the high-quality drivers they make in-house. Many audio enthusiasts are familiar with Dynaudio’s many lines of consumer-oriented speakers, from the entry-level Excite to the cost-no-object Evidence series, but Dynaudio also has a large presence in professional audio. 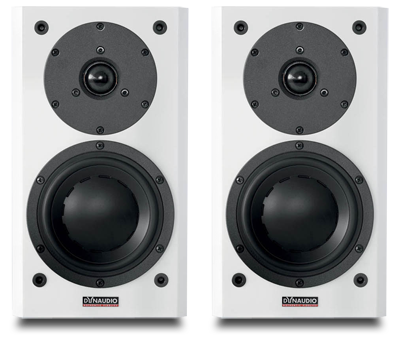 There’s a good chance that, at some point in the creation process, many of your favorite albums were mixed or mastered using Dynaudio monitor speakers. Dynaudio’s studio monitors are mostly active designs, so it’s somewhat odd that the company’s consumer lines contained no active models. That has changed with the subject of this review, the Focus 110 A ($2450 USD per pair). The Focus 110 A is a compact, biamplified, stand-mounted monitor with dimensions of just 12"H x 6.8"W x 12.7"D. Its ported cabinet is tapered from front to back to reduce internal standing waves, and the front edges are beveled to reduce diffraction. The cabinet is made of 18mm-thick MDF and is internally braced, which makes for a very solid enclosure that nicely passed the knuckle-rap test, producing only a dead-sounding thud. Each speaker houses an active crossover and a pair of 50W class-A/B amplifiers with just one single-ended input. If the smallish power rating concerns you, fear not; I found it more than adequate, thanks in large part to the active crossovers, which are more efficient than their passive counterparts. On the rear panel are some useful tone controls, which allow you to adjust the bass by +/-2dB, the highs by +/-1dB, or to attenuate the midrange by as much as -4dB. A low-pass filter makes possible a cutoff frequency of 60 or 80Hz -- useful for those who want to dredge the last octave with a sub while simultaneously freeing up a little more headroom from the speakers themselves. On the rear panel is a switch that lets you adjust input sensitivity by +4/-10dB. Also on the rear panel is the Power switch. The 110 As can be left on at all times without causing any damage, but I can’t help wondering why makers of active speakers have never adopted auto-power, as has been used in subwoofers for years; i.e., the speakers could automatically turn themselves on when they detect an input signal, and off after a given period of inactivity. This would save on energy consumption, and be more convenient than having to reach around to the back of the speakers every time you want to turn them on or off. The 110 A’s 5.7" midrange-woofer is made of a single piece of Dynaudio’s Magnesium Silicate Polymer (MSP), which combines low weight and controlled rigidity with low internal resonance, and eliminates the need for a dustcap to be glued on at a later stage; its large central dome is said be optimized for smooth dispersion. The woofer has a large central magnet system and an oversized yet lightweight 3" aluminum voice-coil. Via a 6dB/octave, first-order crossover, the midrange-woofer hands off to the tweeter -- a 1.1" Esotec+ with a specially coated fabric dome -- at a very low 1300Hz. The 110 A is available in a number of real-wood finishes -- Maple, Walnut, Rosewood, Black Ash -- as well as Piano White and Piano Black. As beautiful as high-gloss finishes can be, I’ve never been a fan; I find that, even with careful cleaning, swirl marks abound. Such was the case with my Piano Black review samples, which before their arrival had seen duty elsewhere. Grilles are included, but their thick frames should preclude their use unless absolutely necessary: Removing the grilles offered significantly smoother frequency response. But with curious 14-month-old fingers at large in my house, I made sure to keep the grilles on only when I wasn’t listening. The speaker’s attractive face is somewhat marred by the holes and screws used to affix the grilles and drivers to the baffle. Concealed fasteners and magnetically attached grilles would be welcome additions, though overall I found the 110 A quite handsome. After a lengthy session of listening, measuring, and adjusting their positions, the Focus 110 As ended up perched atop beefy 24" stands, tilted back about 3 degrees, toed-in so that the inside side panel of each speaker was only just visible, and well away from any room boundaries in my less-than-ideal, 12’ x 17’ room: 4’ 10" from the long wall behind them, more than 5’ from the walls to either side, and 5’ 10" from each other and from the listening position. The frequency response measured flattest when the EQs on the rear panel were set to flat, though with some bass-light recordings I enjoyed the extra bass punch offered with the bass set to the +2dB position -- which just goes to show how useful the EQ settings can be. I mostly drove the 110 As directly from the variable output of my remote-controlled Hegel HD20 DAC. Hegel’s Anders Ertzeid had told me that the HD20’s digital volume control performs optimally from about volume setting "60" and up. So informed, I was able to set the input gain selector on the Focus 110 As to -10dB, so that all of my listening was done comfortably between the HD20’s "60" and "100" volume settings. The Focus 110 A most closely resembles Dynaudio’s BM5A Mk.II professional model. I’ve used a pair of original BM5A monitors for the last few years in an office system, and found that the Focus 110 A shared many of its virtues, but with some subtle differences: The BM5A is larger, with a 6.9" woofer; the two speakers share similar amps, though the BM5A’s crossover frequency is 200Hz higher, at 1.5kHz; the 110 A uses a higher-quality Esotec+ tweeter, with a better coating and a stronger ferrite magnet; and it has superior finishes and cabinet construction. 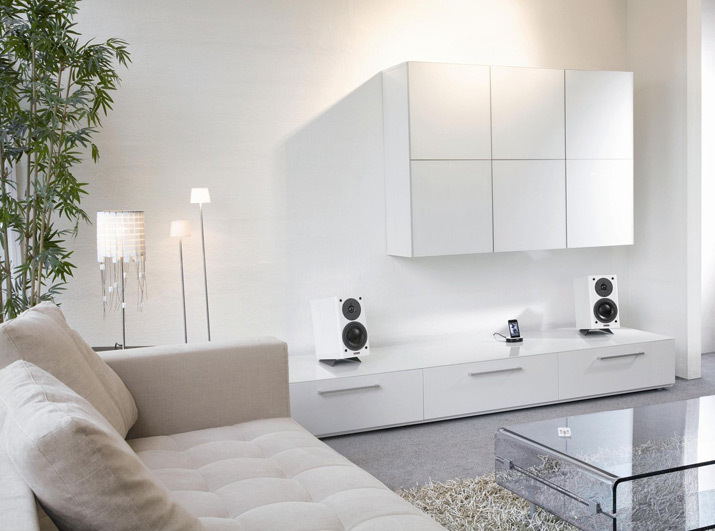 Dynaudio hails from Denmark, Hegel from Norway; the two Scandinavians made beautiful music together. Captivating as the sound was, I often found it necessary to set aside my notes and just focus on the music. "Danes don’t lie" has long been one of Dynaudio’s mottos, and in my listening I found this a fairly accurate descriptor of the Focus 110 A. Its tonal balance was just slightly warmer than that of the more neutral BM5A. I never felt the sound was noticeably colored in comparison, but the Focus 110 A was smoother and a little more laid-back from the midrange through the highs. These traits made for a speaker with very good detail retrieval -- one that I could listen to for long periods of time without fatigue. Less-than-ideal recordings -- of which I own many -- were palatable, even enjoyable, in a way they sometimes aren’t through speakers that are more analytical or in your face. This is not to say that the Focus 110 A sounded recessed in any way -- it presented music in a very intimate fashion, even at low volumes -- but that its upper mids and treble had a smoothness that made it very listenable. Some speakers that share these traits, or that have more treble refinement, do so at the expense of treble sweetness; they’re inoffensive but uninvolving. What made the 110 A special was that it was easy to listen to, but at the same time drew me into and engaged me with the music. The Focus 110 A’s small size might lead one to suspect that a pair of them would be imaging champs, and so they were. When I closed my eyes while listening, I "saw" a very stable central image -- it was easy to visualize where the performers were placed on stage. The speakers were able to disappear nicely, and images were taller than I might have expected. The 110 A is small enough that, even sitting on 24"-tall stands, their tweeters fired at well below ear level; this was when I tilted the stands back about 3 degrees, to aim the tweeter axes more directly at my ears, which raised the image height to just above the tops of the speakers. It was an unusual feeling, but it worked well -- those taller images were a big contributor to the speakers’ overall impressive imaging abilities. The Focus 110 A’s small size might also lead one to assume that it would sound a bit thin or light in the bass. This wasn’t the case either; the 110 A’s bass never failed to impress. In fact, the sheer quantity of bass it was capable of was mind-boggling. The actual radiating area of the 5.7" midrange-woofer is only 3.75" wide, so the fact that the pair of them (with some help from my room) were putting out substantial bass below 50Hz at very high SPLs can only be considered a testament to the good engineering that has gone into this little speaker. But the quality of the 110 A’s bass was also very good: well defined and fleshed out, fairly taut, and providing a good foundation for the rest of the audioband. Those who require the very lowest frequencies may want to add a subwoofer, but I never felt one was necessary. The 110 As’ soundstage extended a few feet outside the speakers in both directions, as well as a few feet behind them when the recording contained such information. The speaker’s dynamic range was impressive, which made for a punchy sound that handled dynamic transients with aplomb. Up to as loudly as I could stand playing them, the 110 A’s sound never seemed to change. I could turn the volume up and up with no audible distortion, congestion, or compression. However, this came as no surprise; each Halloween, I use the BM5As to play sound effects at high SPLS for hours, and they never complain either. The Focus 110 A’s midrange was very neutral, conveying the source signal with little coloration. Female voices sounded natural, without undue richness unless it was in the recording. 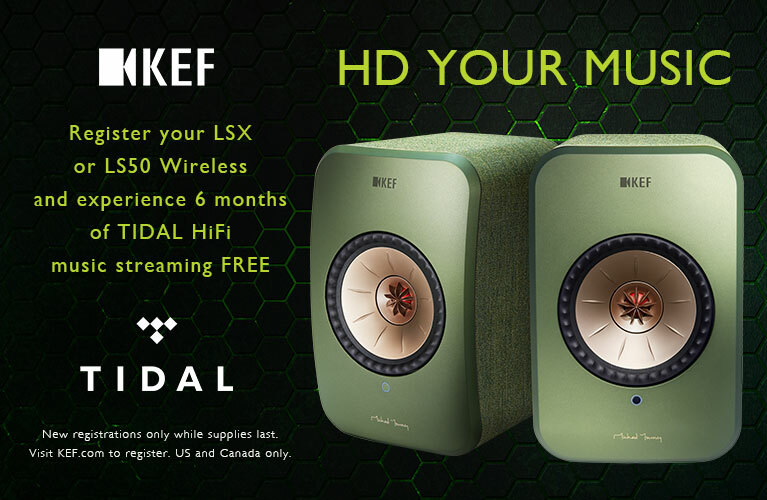 Notes seemed to decay faster through the Hegel-Dynaudio combo than through some more romantic-sounding speakers or equipment; but as the Dynaudio’s overall sound was fairly quick, with very little overhang or bloat, this was in keeping with the rest of the speaker’s character. Before receiving the Focus 110 As, I was interested to hear how these more expensive consumer monitors would stack up against my BM5As, which retailed for $1000/pair when I bought them at a local guitar store a few years ago. The Focus 110 A looks much better than the BM5A, which offers a lot of sound per pound; concessions to its low price were made in the cosmetics department. The BM5A’s black-vinyl finish is an industrial-looking and unconvincing facsimile of real wood, whereas the high gloss, real-wood veneers of the 110 A are appropriate to its price. The 110 A’s smaller size will only increase its Spousal Acceptance Factor at the expense of the larger BM5A, and the 110 A’s build quality is better; remember that tapered cabinet, and the Focus’s noticeably deader thud when rapped with a knuckle. The BM5A also accepts only an XLR input, compared to the 110 A’s single-ended RCA connection, which is far more common on consumer-oriented electronics. The 110 A also uses higher-quality, Esotec+ drivers than the regular Esotec drivers in the BM5A. While the two Dynaudio models shared similar traits, the Focus 110 A sounded smoother, more refined, and more laid-back overall -- the difference wasn’t huge but was readily apparent. The big difference was in the bass performance. The 110 A’s -3dB point is specified as 45Hz, compared to the BM5A’s 50Hz. I wondered how or if the diminutive 110 A, with its smaller midrange-woofer, would squeeze out more bottom-end extension. I don’t know how Dynaudio did it, but they did. Measurements in my room confirmed that the Focus 110 A did indeed go lower with less overhang, and with an extra measure of bottom-end tightness, though the BM5A seemed to have more midbass impact. I preferred the 110 A’s sound, but at the same time feel that the law of diminishing returns may have kicked in somewhere between the BM5A and the Focus 110 A.
I thoroughly enjoyed my time with the Dynaudio Focus 110 A. It offered a beguiling combination of smoothness, accuracy, and transient speed with low-end extension and dynamic capabilities that belied its small size. The price of $2450/pair is reasonable for what the Focus 110 A does, but the fact that the speaker includes four channels of amplification tailor-made for the drive-units they’re connected to makes them a relative bargain. Price: $2450 USD per pair.